Bump, Set, and SPIKE! That is what I am constantly thinking about. Yeah, I play volleyball and it is practically my life. It can get expensive with buying all the gear and medical stuff (if it's needed). The club I play for buys every single player two uniforms, shoes, spandex, kneepads, two shirts to practice in, warmups, and a backpack. Some of you may be thinking spandex?! Yeah, spandex, the shorts that bikers wear, but shorter so you can move better. Actually they aren't bad. 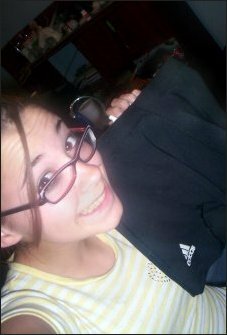 I love spandex because it's so comfortable! If you are wanting to play volleyball and you need kneepads, don't get the big, bulky ones. They keep you from bending your knees. 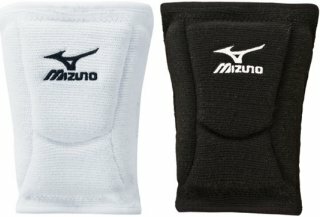 I have two pairs of Mizuno kneepads. They are kind of thin, so you are able to move a lot more than with those bulky ones, and they have better padding on the high impact zones. For example, when diving on your knees and going to your knees, those areas that you normally land on are padded better. In addition to volleyball, they also have gear for other sports such as golf, baseball, softball, and running. Volleyball isn't really about looking good. It's about playing the game. Of course, you want to look like you have spirit though. A good way to show team spirit is to wear team colored socks or hair bows. 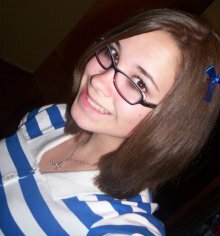 My team made bows for everyone, and almost every game we wear them. Also, our team purchased matching socks. 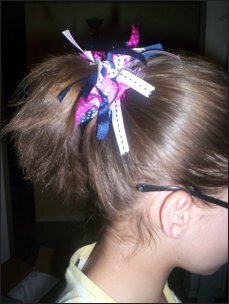 So whether you have hair bows or ribbons you're showing team spirit. Be careful when you are playing though. Medical issues in volleyball are very common. One of the older girls in my club went to the hospital with a concussion. She got elbowed in the temple and it caused her to pass out. A lot of girls in our club got injured last year at our end-of-the-season week long tournament. One girl tore the ACL (anterior cruciate ligament) in her knee, and her volleyball career is probably over. The ACL is one thing you don't want to hurt. I myself also got injured. On the third day of our tournament I sprained my ankle, and I was out the rest of the week. Walking on crutches and not playing - that was the worst. So if you have weak ankles, maybe it's best to get Active Ankles. Whether you sprain your ankle or your thumb make sure you take care of it and get it healed. 2. Don't get frustrated with yourself. If you shank a pass or miss a serve just let it go. You can't get the play back. So shake it off, and come back with a great play. Trust me, I should know. Trying to play with frustration does not work at all. 3. Listen to your coaches. They are there to help you improve your skills. 4. If you're injured there are two things you should do. One, don't play. If you play with say, a sprained finger, you are just going to make it worse. Two, ask your coaches what you should do to help it heal faster. They'll know. Hope these tips helped you. Message me using the form below if you have any comments.